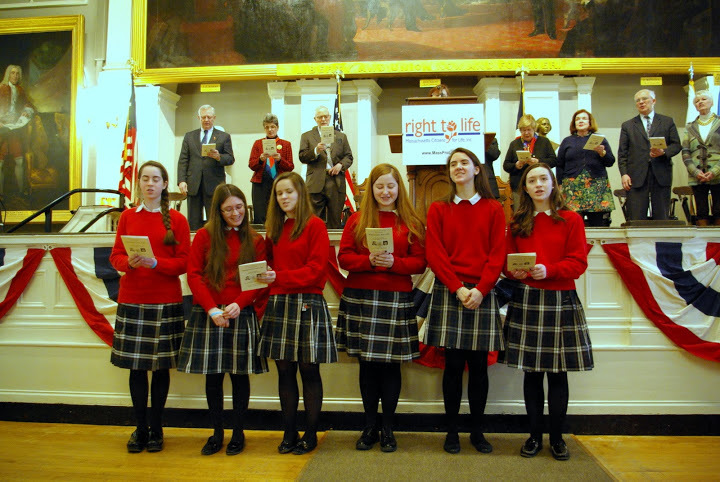 The Assembly For Life is always a special time for Bay State Pro-lifers. We gather, commemorate, recharge, get inspired to continue the fight. This year’s assembly was especially good. The theme: Massachusetts at the Supreme Court was very well addressed by both keynote speakers, Francis Fox, Esq. and Philip Moran, Esq., who spoke on the historic FEC v. MCFL case and the current McCullen v. Coakley buffer zone case, respectively. EMCEE Jaymie Stuart Wolfe was fantastic as usual and the Montrose School Treblemakers once again gave an excellent performance. The attendees were also led in beautiful prayers by members of the clergy. Many people showed up to Faneuil Hall despite the cold. If you weren’t able to attend, you should consider coming next year. Click above to see all our photos from the event.